Alliance HealthCare Services, Inc. (NASDAQ:AIQ) , a leading national provider of outsourced healthcare services, announced today that Luther W. Brady M.D., Director of Medical Research at The CyberKnife Center of Philadelphia (an Alliance Oncology partner facility), was awarded George Washington University President’s Medal. Dr. Luther W. Brady speaking at the President’s Medal ceremony at George Washington University. Photo courtesy of GW University. The George Washington University President’s Medal, the highest honor the university president can award, recognizes individuals who have exhibited courage, character and leadership in their chosen fields and who exemplify the ability of all human beings to improve the lives of others. Dr. Brady is the founder of The CyberKnife Center of Philadelphia and one of the most distinguished pioneers in the field of radiation oncology. He is recognized as one of the world’s foremost experts on cancer treatment and has published more than 600 papers and led numerous clinical trials. Virtually every radiation oncologist in the world is familiar with his textbooks and the Encyclopedia of Radiation Oncology (Brady-Yeager Eds.). He has won over thirty medals for his contribution to the medical field and has served as president of every major radiation oncology professional society. Dr. Brady was born in North Carolina and received his undergraduate and medical degrees at George Washington University. He received post-graduate training in radiology and radiation oncology at the U.S. Naval Hospital in Bethesda, and in Philadelphia at Jefferson Medical College and the Hospital of the University of Pennsylvania. He has had appointments at Harvard Medical School, The College of Physicians and Surgeons of Columbia University, and has spent the majority of his career in Philadelphia first at the University of Pennsylvania, and since 1959, at Hahnemann University Hospital. 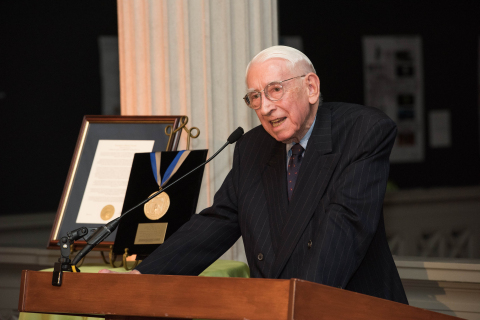 He is a physician with an extraordinary range of interests and activities, and George Washington University chose to honor him for his support and contributions to medicine and the fine arts. In spite of extensive commitments throughout the United States and around the world, he continues to be directly involved in patient care, the teaching of undergraduate medical students and post-graduate training of residents in radiation oncology. Dr. Brady was presented the award by George Washington University President Steven Knapp on George Washington’s Foggy Bottom Campus in Washington, D.C., on May 16. Prior to this award, George Washington University bestowed Dr. Brady the Distinguished Alumni Achievement Award (1991), the GW Society Medal (1995) and an Honorary Doctor of Fine Arts degree (2004). Philadelphia CyberKnife is a service of Delaware County Memorial Hospital, a member of the Crozer-Keystone Health System, and is an Alliance Healthcare facility. The center is located off the hospital’s main campus at 2010 West Chester Pike in Havertown, Pennsylvania. For more information about Philadelphia CyberKnife, or to determine if you or a loved one may be a CyberKnife candidate, please visit www.phillycyberknife.com or call (610) 446-6850. Most insurance plans and Medicare are accepted. Alliance HealthCare Services (NASDAQ:AIQ) is a leading national provider of outsourced healthcare services with a 30+year track record of award-winning patient care/satisfaction and service line expertise. Providing diagnostic radiology services through its Radiology Division (Alliance HealthCare Radiology), interventional radiology & pain management services through its Interventional Services Division (Alliance HealthCare Interventional Services) and radiation oncology services through its Oncology Division (Alliance Oncology), Alliance is the nation’s largest provider of advanced diagnostic mobile imaging services, an industry-leading operator of fixed-site imaging centers, and a leading provider of stereotactic radiosurgery nationwide. As of March 31, 2015, Alliance operated 523 diagnostic imaging and radiation therapy systems, including 117 fixed-site imaging centers across the country; and 31 radiation therapy centers, including 19 stereotactic radiosurgery (SRS) facilities. With a strategy of partnering with hospitals, health systems and physician practices, Alliance provides quality clinical services for over 1,000 hospitals and other healthcare partners in 44 states where approximately 1,800 Alliance Team Members are committed to providing exceptional patient care and exceeding customer expectations. For more information, visit www.alliancehealthcareservices-us.com.